I miss you so much,whenever we are apart I just can’t wait to see you. I miss you so much, I just wanna squeeze you so tight and never let you go. I miss you so much, I just wanna cover you with kisses and never stop. I miss you so much,please hurry back into my arms until the end of time…Missing Someone is not about how long it has been since you have seen them or the amount of of time since you have talked.it’s about that very moment when you are doing something and wishing they were right there with you…I miss you when something really good happens,because you are the one I want to share it with, I miss you when something is troubling me,because you are the one who understand me so well. 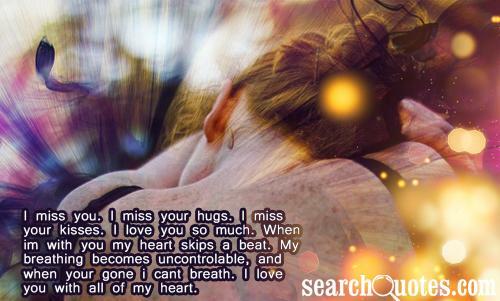 I miss you when I laugh and cry,because I know that you are the one that make my laughter grow and my tears disappear. I miss you all the time,but I miss you most when I lay awake at night and think of all the wonderful times we spend with each other,for those were some of the best times of my life…When I miss you sometimes I listen to music or look at picture of you.not to remind of you but to make me feel as if I am with you.it makes me forget the distance and capture you…Nobody understands how much I miss you, I miss how much we used to talk and miss all the things we used to do. I try not to admit it to myself that I still feel this way.nobody knows that I still wake up thinking of you each day. I still think of you and I really do miss you. I would give up everything i have to be everything were not.. 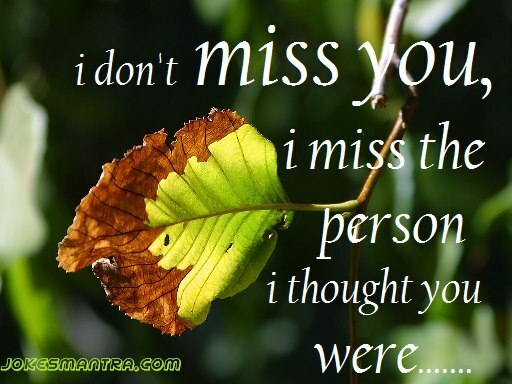 Sometimes it’s not the person you miss,but the feelings and moments you had when you were with them. I miss you.i miss your hugs.i miss your kisses.i love you so much.when i’m with you my heart skips a beat.my breathing becomes uncontrolable, and when your gone i can’t breath.i love you with all of my heart. Just needs wings to fly,to where you are..missing you so much. I will miss you,but i was fine before you and i will be just fine after you. You come to mind morningly,nightly,and noonly,i wish i could see you this minute or soonly..so you are probably right if you are thinking it seems like i am thinking this missing-you thing to extremes! You may be out of my sight,but not out of my heart,you may be out of my reach,but not out of my mind,i am always thinking of you. 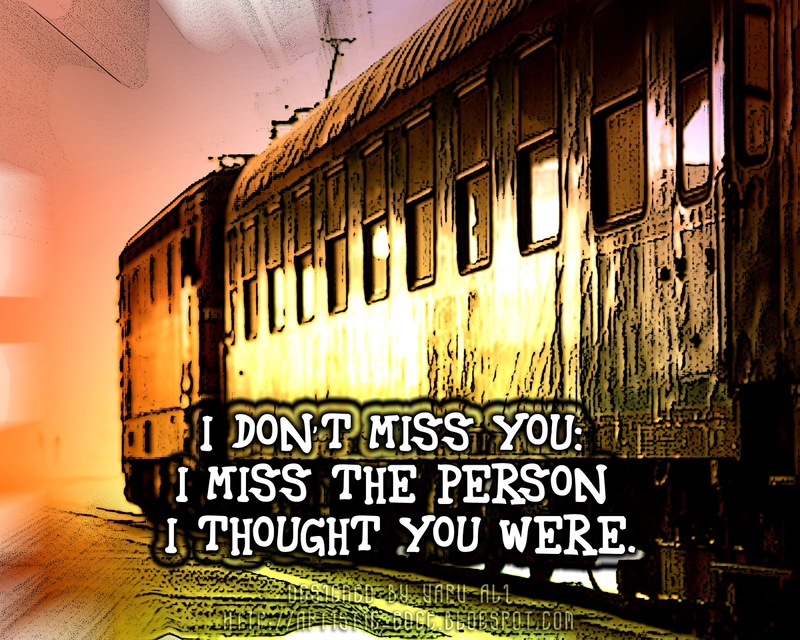 I don’t miss you,i miss the person i thought you were. It’s not enough to say you that i miss you. 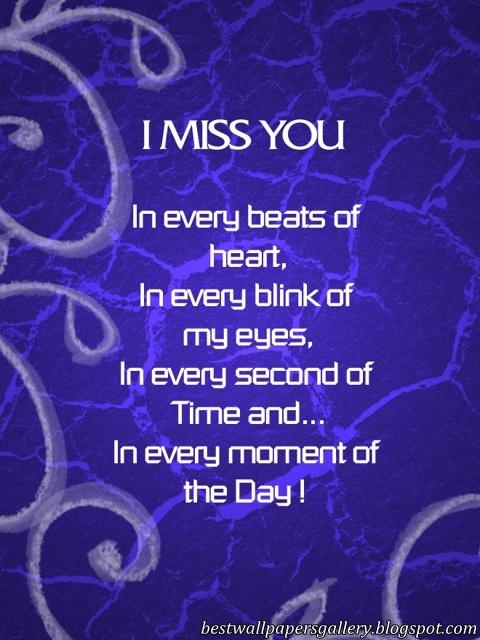 I miss you,in every beats of heart,in every blink of my eyes.in every second of time and in every moment of the day. 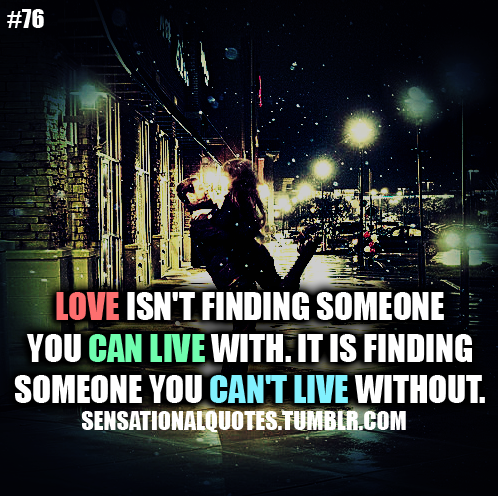 Love is not finding someone you can live with.it is finding someone you can’t live without. Just know that wherever you are,i miss you and i wish you were here. I try not to miss you.i try to let go.but in the end.you’re always on my mind. 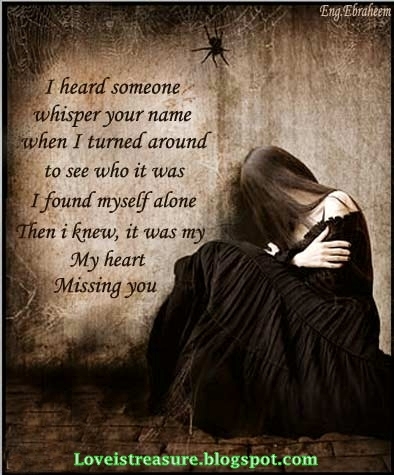 I heard someone whisper your name when i turned around to see who it was i found myself alone then i knew,it was my,my heart is missing you. 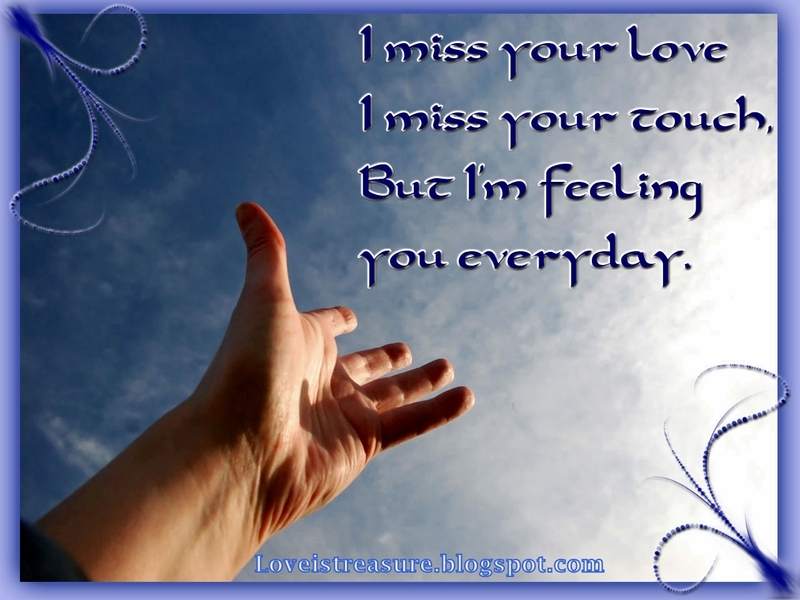 I miss you love,i miss your touch,but i’m feeling you everyday. Come and kiss this pain away.i am alone without you. 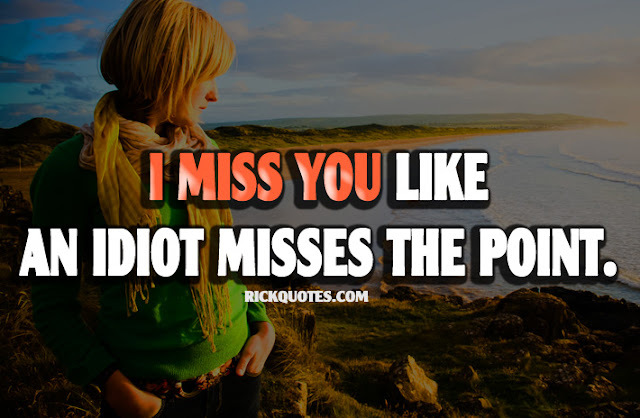 I don’t miss you:i miss the person i thought you were. I hide my tears when i say your name,but the pain in my heart is still the same.although i smile and seem care free,there is no one who misses you..more than me.. I miss you only on two occasions,that’s day and night. I miss you.my heart is longing for you,my eyes want to see you my arms want to touch you i’m nothing without you. 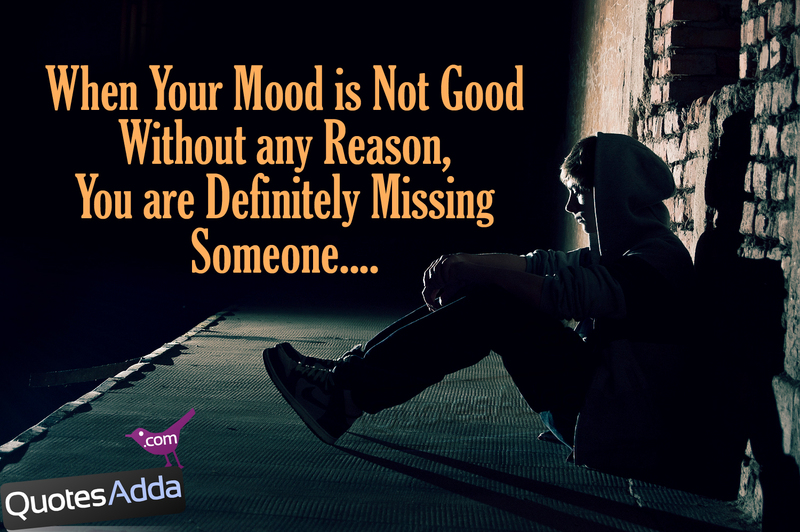 It feel great when you miss some one and they suddenly call you. Sometime words cannot explain the feelings of mind,but still i can find the love in your eyes. Standing here thinking about how much i miss you.